What is the Cowboy College Program? Using traditional cowboy values and skills, the Rockin’ R Cowboy College (RRCC) will show each student the worth of a life built around honest hard work, the value of education, and the freedom of being truly trustworthy and independent. Greenhorn (Learn) – Structure: Assist each student in setting routines & work closely with him (or her) to ensure that responsibilities, tasks, and school work are accomplished. Students are introduced to, and begin to work with, their young horse. 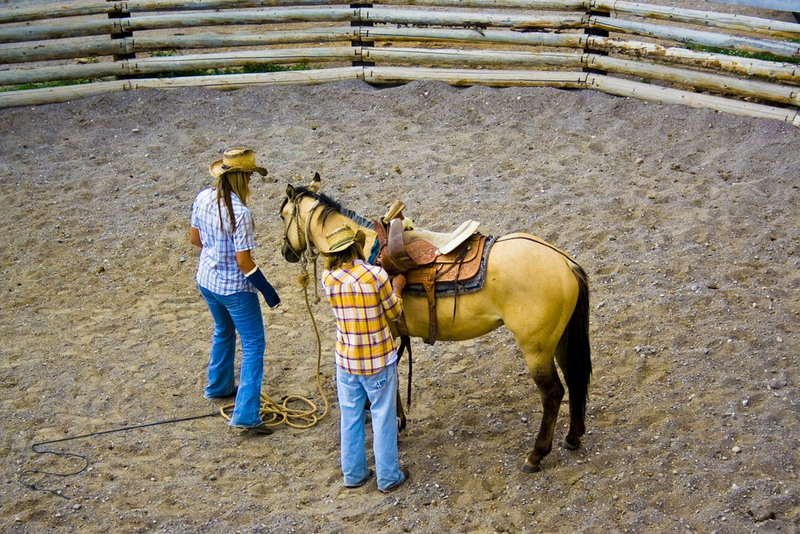 Basic cowboy and horsemanship skills are introduced. Each student also assists in developing an educational program tailored to fit their individual academic needs. Some will work on obtaining a GED, others will start or continue college through online programs. Trailhand (Do It!) 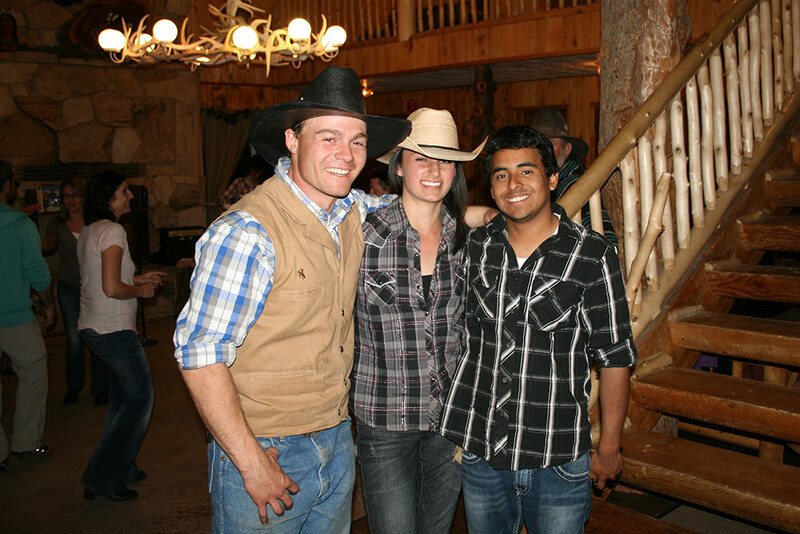 – Structure: Students rotate through different cowboy positions to assist in learning real life skills. Positions include: Cooking, Housekeeping, Agriculture, Animal Husbandry, Basic Auto Mechanics, Carpentry, Natural Horsemanship, Animal Training, Farming and Ranching Chores, and much more. Students are required to “Ace” certain skill sets, as well as maintain a high academic standard. Success in caring for and training their young horse is a must. Ace High Top Hand (Master) – Structure: As students continue to perform their daily “labor positions” and continue life at the RRCC, they begin to gain confidence in themselves and in their cowboy knowledge. Students learn how to balance their even more demanding schedule of work, school, and Cowboy Skills. At this point, our students begin to work independently in many of their tasks. Each student concentrates on a specific skill that they have begun to develop. They focus on this skill and work diligently to “Master” it during this step. Continued care for the student’s young horse is essential. Cowboy (Teach) – Structure: The “Cowboy” step is as different as each individual student. Students are in charge of not only their own schedule, but also spend time working with the greenhorns in a leadership position. They have learned how to organize their classes, set up a daily “to do” list, schedule competition events for their horse to compete in, and cook for the entire “bunkhouse”. They are not a part of the College at this point, they are the Cowboy College. Every student will have their own horse to work with, train and eventually ride. They will be able to train this horse in any direction they desire. Pleasure Riding, Cutting, Competition Roping, Sorting Cattle, Jumping, Dressage. Each step in the program requires hard work, dedication, and grit in order to “graduate” to the next phase. While our GREENHORN first step closely monitors and encourages new students, the TRAILHAND second step, then ACE-HIGH TOP-HAND third step are designed to teach cowboy skills, hard work and trust. After graduating from the Ace-High Top-Hand third phase, the students that qualify will continue on to COWBOY status, the fourth and final step in their journey. During this step, students can apply for a position at the Rockin’ R Ranch Lodge and Guest Ranch and can begin earning wages and applying the skills learned in Cowboy College. These four steps are tried and proven over centuries to help individuals grow and learn how to live a fruitful life. We simply took what any cowboy would teach his children and defined it in four steps. Trust and hard work. Our students learn, do, master, and eventually teach these principles. When they do this, they become capable of climbing the tallest mountain, running the longest race, and reaching the furthest horizon. Trust is the core value to the Cowboy way. A true cowboy learns to trust his hands through hard work, learns to trust his balance on a buckin’ horse, and learns to trust his horse and his team of riders. But more importantly he learns to trust his instincts. Working the cows together requires teamwork, and through this he is given the opportunity to be trustworthy. The Cowboy hones his instincts by DOING. He rides the horse that needs to be rode. He fixes the fence that needs to be fixed. He watches the herd through the night because he knows he has been trusted to do so. Trust comes from within by DOING what needs to be done, and the Cowboy knows he can trust his decisions and that his decisions will instill trust in others. We become stronger mentally and emotionally when we are challenged to reach beyond our limits. Why Hard Work? There is nothing easy about being a Cowboy. There is a challenge everyday that you must have the perseverance to accomplish. The American Cowboy worked in extreme conditions, with unruly livestock, in harshly unpredictable landscape. He did all this for very little pay. His reward was the respect he earned, the trust he built, and the satisfaction that he could conquer any challenge given. Sometimes the rewards for hard work have no monetary value involved, but the lessons learned can have lasting benefits that reach throughout an entire life.